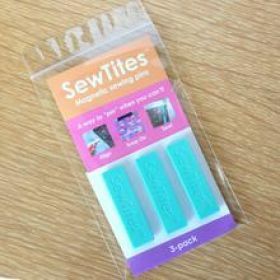 SewTites are a way to pin when you can't – magnetic “pins” for sewing super thick materials, like leather or cork, or pieces that aren’t near an edge, like pockets on bags. Not to mention, they make working your English paper piecing projects easier than ever – no more hand cramping and stitching around pins or clips! Simply align the pieces you need to sew together, snap on the SewTites, and sew! No more pin holes. Easily keep thick materials together. Won't break like clips. Safe to use with computerized sewing machines – just don't store them on them!